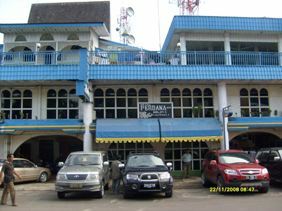 Hotel Perdana is a budget hotel in central Banjarmasin. The building is quite old though the rooms are clean and the owner and staff very friendly. Prices include breakfast and an afternoon snack. Just around the corner you can get free WiFi Internet access at StarBread Bakery and Cafe. This has got to be the best budget hotel in Banjarmasin. The rooms are a bit old and basic though clean, comfortable and have TV's with international channels. It's in a fairly good location, not far from the Martupura river and they have the night markets right out the front with a good selection of food. Breakfast is brought to your room every morning, generally 2 boiled eggs, bread and tea. And every afternoon they bring a snack (usually cake) and tea to your room. If you are out they leave this on the table outside your room for you to have later.